• Machemes replicated by a preprogrammed evolutionary algorithm, like the Tierra computer model. • Machemes replicated by humans, for example by pushing a button to send an e-mail. • Machemes replicated by machines without human intervention, for example the Goodnight- Bot talking to other bots. There are at least two important parameters which influence the evolvability of machemes: the network and the units of selection. Given a high enough quantity of technology, the structure of the network will become so complex that evolution will arise spontaneously. The units of selection have to be successful enough to allow for evolution. The combined complexity of technological systems causes evolution to arise. Each individual system’s simple rules together lead to complex patterns which can explain this behavior. Since this form of evolution arises spontaneously, it is truly open ended. The selection criteria are defined by the ever changing world the machemes inhabit. One of the first implications of the complexity and the quantity of technology is that evolution will arise spontaneously. Furthermore we cannot oversee our programming implications and oversee all the rules we created. Even in my simple bots example, the bots were autonomous tweeting to themselves and to each other. When machemes are observed, there is a significant difference wether the observer is another macheme or a human. When the observer is a human, the macheme will become a meme. When the observer is a macheme, the information will become another macheme. There is transmission of information from humans to machines and vice versa. hand, are able to become autonomous, just like genes. 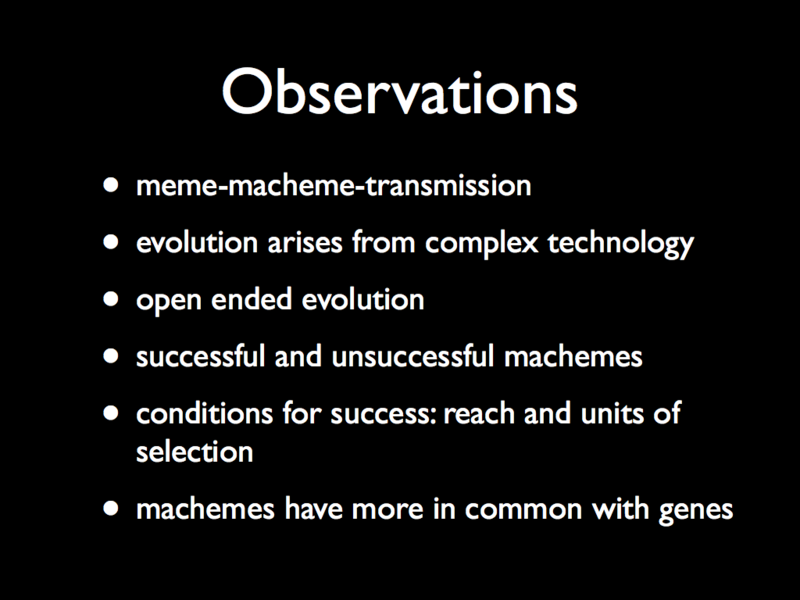 I conclude that machemes have more in common with genes, than memes have in common with genes.